Free fonts are a valuable resource for most designers, developers and beginner artists as well. Currently we have thousands of fonts to choose from. Few years back it wasn’t the same, most modern and beautiful fonts had a price tag. But today everything has changed, many generous font designers have designed fonts that resemble the same as paid fonts and are absolutely free to use. With all these beautiful fonts available for free download, there is no reason why one should go for paid fonts. Searching for good fonts is not an easy job , mostly because there are millions of free fonts out there. and the search even gets more complex when you start evaluating fonts from the alphabets itself. There are lot of websites on the internet that offer free fonts for both personal and commercial use. But not all the sites are safe, many of these sites offer free fonts as well as pirated fonts and even there are websites that offer fonts laced malwares. Definitely nobody wants viruses with fonts , even if we get it for free. Here is our selection of 5 of the best websites to download free fonts for both personal and commercial use. We are definitely sure all font lovers would love these sites. Note: Most fonts on these site are freeware, some are shareware or linkware. Please review any files included with your download, which will usually include information on the usage and licenses of the fonts. If no information is provided, please use at your own discretion or contact the author directly. This is my first stop for each of my hunt for free fonts online. Dafont has got huge database of free fonts which can be used personally as well as commercially. Currently the site has more than 22,378 fonts to choose from. 1001 Free Fonts first opened its doors in December 1998 and has since grown to become the most popular free fonts archive online. They receive more than 50,000 visitors daily and have received 150,000,000 visitors since 1998. Over 3,000,000,000 free fonts have been downloaded since 1998. UrbanFonts features an amazing collection of free fonts, premium fonts and free dingbats. With over 8,000 freeware fonts,This is definitely one of the best place to download fonts! Abstractfont lets you browse through its huge database of more than 20,000 free fonts. All these fonts are uploaded by various designers all over the world. You can browse the free fonts here by category, designer, recent, popularity, and language. 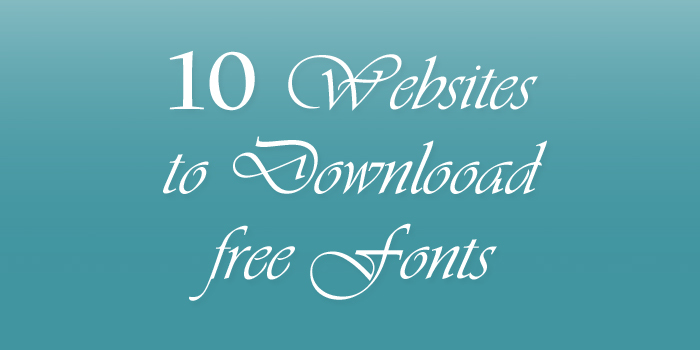 Additionally if you sign up on their site, you will be able to download up to 100 fonts in one zip file. Another great site to download free fonts. You can browse through their collection of 22,547 fonts that have been shared by designers all around the world. Fontstruct is a bit different from the other sites mentioned here. Apart from downloading free fonts, you can even create our own fonts at fontstruct and share them for free. Acidfonts has a vast database of free fonts to choose from, which are arranged in different categories. Fawnt is a font resource for designers, developers, and anyone that appreciates the web’s highest quality fonts. the site has more than 10,000 of free fonts available for download. And as the site says, have a look at their fonts database before you purchase any fonts, Maybe you don’t need to buy fonts. On FFonts you will find free fonts for windows, free fonts for mac, true-type fonts free download, free true-type fonts.